Twitter Ecosystem, Preserve or Plunder? Twitter just posted a triumphant blog entry about the success of owning “official” applications on all mobile fronts. 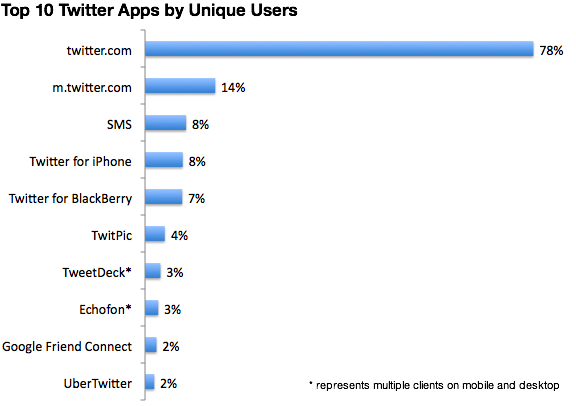 One interesting trivia from the graph is that Twitter’s iPhone client accounts for 8% of unique users. As a result mobile users “jumped 62 percent”. This strategy has been quite successful. Total mobile users has jumped 62 percent since mid-April, and, remarkably, 16 percent of all new users to Twitter start on mobile now, as opposed to the five percent before we launched our first Twitter-branded mobile client. As we had hoped in April, these clients are bringing more people into Twitter, and, even better, they are attracting and retaining active users. Indeed, 46 percent of active users make mobile a regular part of their Twitter experience. Twitter’s growth and evolution is really an interesting story. They take something really simple, sharing 140 characters of text with an asymmetric friend graph (you can friend but not be friended), open api for reading and writing, then let the community do the rest. Up until now, all the innovations outside of the scaling woes for the backend were all community-driven. The use of “@” for replies and “#” for topics was started by users, search was an external service that got bought out, Tweetie was acquired to become Twitter for iPhone, the twitter button was done by tweetmeme before they provided an official version, and url shortening (to conform to 140 characters) was outsourced to tinyurl then bit.ly though they’re rolling out their own. About the only thing they haven’t taken over yet is the sharing of pictures. I would not be surprised if they rolled something out before the end of the year. The pro for Twitter is greater control over their brand image not to mention access to better data and ability to reach users. Their moves are already paying off in terms of accelerating their growth further. However, when you look at the innovation that came out of third-party solutions it becomes apparent that Twitter needs to start innovating in-house to keep their competitive edge rather than poaching their eco system for exciting ideas. The reason why Twitter’s eco system thrived so much is because they had one of the hottest services to emerge in years yet they left so much money on the table for features that users were hungry for. One question for readers, are there any other areas Twitter can grow or the eco system can provide? It seems like the eco system is looking pretty solid right now. Apple’s Ping just got 1 million users in 2 days. Granted they already have your email and credit card number, it’s still a nice launch that even the most promising web startups can replicate. Although initially spurned by Facebook, the companies are still in discussion. What other social components could Apple be possibly developing next? Location maybe? Game Center will perhaps have a broader and direct impact on connecting users through competition and also require a significant investment in infrastructure. However, the success or failure of Ping will be something others at the intersection of web and music will be paying close attention to. As a sign of life, Ping is already getting spammers. 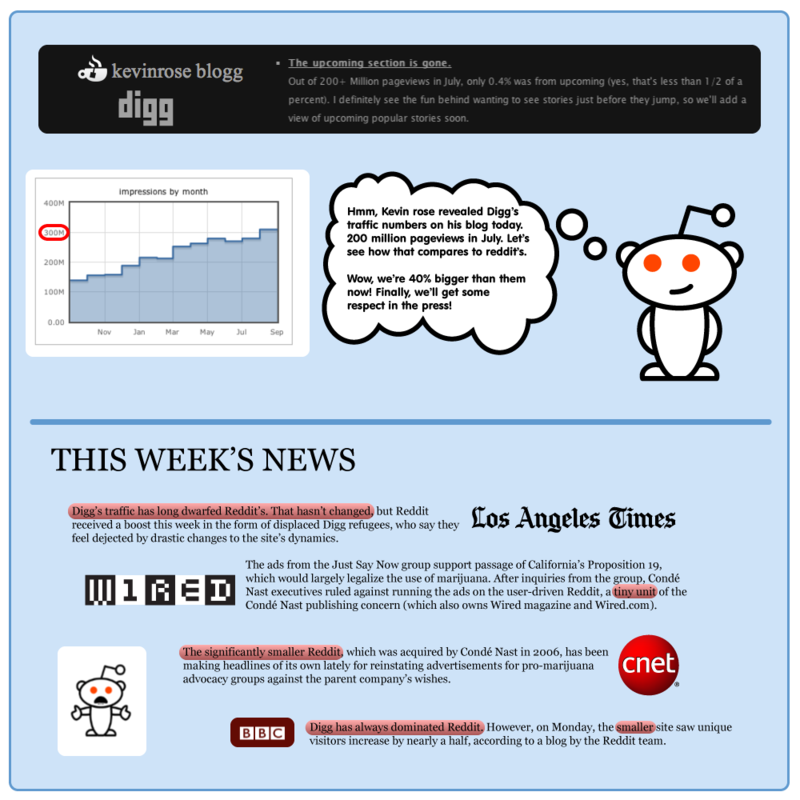 The rivalry between Digg and Reddit is something of a staple in the social news scene. Now with the latest revolt over Digg’s new design (version 4) that gives media a more powerful presence accompanied by a total rewrite, people are what this means for the future of Digg and attention is shifting towards Reddit. Perhaps even more now that Reddit now has 300+ million pageviews compared to Digg’s 200+ million. Even before the latest revolt, the scene around Digg changed quite dramatically. At the beginning of 2009 Digg downsized staff amidst declining revenue. The long-time CEO Jay Adelson stepped down not to mention . The rewrite/redesign is preceded by an exodus of former engineers. In addition to all this Digg now has a new CEO that takes over from Kevin Rose. Digg has long held the dominant position in social news. It’s hard to estimate the impact Digg has had on the web without reflecting on how instrumental Digg was in launching major media staples such as TechCrunch or Mashable among many other blogs and websites. Unknown sites were suddenly thrust into the spotlight would see their servers go down in flames. The next day they would write about the experience of going down from Digg traffic and make another appearance on the front page. The power and simplicity of Digg inspired many competitors. In fact, so many that have since faded from memory. Perhaps one of the more memorable episodes was when AOL re-appropriated their popular but under-utilised netscape domain (now propeller), put Jason Calacanis in charge (from their Weblogs acquisition), and built a social news clone and hired away prominent Digg users for $1000 a month in compensation. This was launched at about the time Digg removed user rankings from the site when there was an exodus of power users. On the other hand, Reddit has more or less quietly polished their own product since its launch in 2005 as a Y Combinator startup and later acquired by Conde Nast. The founders of Reddit with the exception of Chris Slowe have also moved on. While Reddit content is user-voted like Digg, they take a more hands off approach to the community whereas Digg is known to moderate or squash certain users that fall afoul of their policies or values. Reddit’s algorithm is based on user karma (a trust metric) that comes from submitted content and comments. Another feature of Reddit is for users to create their own “sub-reddits”. Reddit code is also open source. They operate on a small team with a small budget. These days people are more likely to discover topics relevant to them through twitter of facebook rather than sift through the flood of generally popular things on social news sites. If you want a cross section of what’s popular right now TweetMeme probably gives you the most balanced bird’s eye view. The hacker crowd most likely check up on Hacker News created by Paul Graham for both links and quality discussion. For an overview of the latest tech news, TechMeme is another go to source. For example, lets take a look at the front page of Digg and Reddit to see what’s trending. Ford readying Fiesta-based crossover, captured for the first time! As you can see, the sites have moved away from their tech focus long ago. However, one thing remains is that with social media sites like Digg or Reddit, you live by your users and die by your users. In any popular website that relies on user-generated content, the top people making the most important contributions that drive traffic to the site are only a small handful of the thousands or even millions of registered users. One thing that hasn’t changed with Digg over the years is the cult of personality around Kevin Rose and the largely anonymous but rowdy masses that dwell in the comments section. At one point it was driven by power users that have since moved on or became demoralized. On the other hand, Reddit has been consistent in maintaining a hands-off approach to direct moderation (by innovating on their karma algorithm) while keeping a fanatic commitment to their community (even if it means revolting against their corporate parent). It’s a classic example of the tortoise versus the hare. Google Gmail’s priority inbox is rolling out gradually rolling out. In a nutshell it helps you find the needle of critical emails in the haystack of your inbox. If you’re like me or most other users, despite implementing a system of labels, starring, and archiving you still end up missing important messages. Trying to keep your inbox down to zero is a futile attempt that only results in you frantically checking your emails regardless of where you are, be it your desk, on your phone, or even logging in at a random public computer in an internet cafe. You still can’t escape that sinking feeling when you boot your computer on Monday. Gmail already does a great job with spam filters and a core part of their search technology is trying to keep ahead of marketers trying to grab your attention with lackluster content, so it was only a matter of time before they extended that technology to keep you one step ahead of your inbox. The way it works is that you’re given another “priority” inbox that predicts which messages are likely to be important to you. As you go through these messages you vote these messages “+” or “-” depending on how accurate the priority inbox was. For messages that didn’t make the cut, you can vote them up for next time. Within the priority inbox, starred messages are shown in a split view so you can go back and process those. I recently declared email bankruptcy right before I was invited into the beta, but it looks very promising so far. My inbox was getting quite unkempt and now I wont have to worry so much about scanning headers so diligently. Despite being quite useful, I can’t help but wonder how much more dependent I can become on Google and their helpful algorithms before I let my own tastes be defined by machines. The explosion of information coming in via social networks and media is making it more and more important to find ways to curate content. Another approach we’ve seen is social curation efforts such as Flipboard where you’re presented with a mix of news based on what your social network friends are sharing and semantic analysis. This space will probably grow more as we digest more information. The Apple press event did not dissappoint. Apple overhauled the iPod shuffle, nano, and touch. The shuffle sort of took a step back by adding back controls to the body (which many agree is a good thing and also shows their commitment to designing great products even if it means going back to the drawing board). The nano got a touch screen not to mention the fact that it now runs on iOS. Although, you can’t install apps on the new iPod nano, you get all the touch screen sexiness in addition to a FM tuner and integration with Nike+ which is amazing. The iPod Touch gains the much awaited camera (back and front) to enable FaceTime and a retina display. It will also be eventually compatible with GameCenter. The iPad will finally join the multi-tasking iOS4 family in a November software update. iTunes got upgraded to 10, sporting a new logo that drops the CD metaphor. The new iTunes 10 includes a social network called Ping that allows you to follow other users and get recommendations. Although this is nothing new and already defined by a number of startups such as last.fm, pandora, and mog, the big difference is that Apple owns the device and retail space. The iTunes update also includes AirPlay, an updated way to stream your content to other devices. This is where the new $99 Apple TV comes in. In addition to movie and television show rentals, Apple TV now integrates with Netflix and YouTube for viewing and Rotten Tomatoes for ratings. Another interesting feature is the ability to stream from your ipod Touch, iPhone, or iPad (which also double as remotes) to Apple TV. This new feature will be part of an upcoming iOS 4 update. According to tech gossip trickling to TechCrunch, many insiders are saying Facebook will be making $2 billion in 2010 revenue. When MySpace was still on the rise, many pundits were dismissive of how badly social network traffic converted to sales. What Facebook did was focus on clean implementation and technology. As a result, they created their own ad network that produces highly targeted and fine grained controls that are every marketers dream. With 500 million users sharing everything from their real names, location, addresses, hobbies and friends networks, it might even prove to be more lucrative than Google’s network. The challenge will be in keeping targeting quality high as advertising costs go up (with the sites ever growing popularity). There is also the possibility that Facebook could open up their advertising technology for other sites to participate in as well as the very real possibility of more aggressively monetizing social games and other applications utilizing the Facebook platform. As a point of comparison, Google first crossed the $1 billion in revenue threshold in 2004, the year they went public. By 2006 they had $10 billion in revenue, and they crossed $20 billion in 2008.